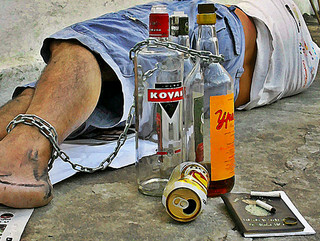 The effects of alcohol abuse -- despite of what you see on TV and in the movies-- is no laughing matter. It's one thing to have a drink with friends every once in awhile. It's another to polish off a six pack on a day-to-day basis and become so inebriated that you behave like another person. Many deaths occur on campuses each year because of alcohol poisoning. Without proper rules and regulations in place, it will only be a matter of time before more universities see an increase in fatalities caused by binge drinking and the effects of alcohol abuse. This problem doesn't seem to go away no matter how badly we want it to. There are a lot of risks involved with binge drinking. Not only is it detrimental to your health, it can also seriously impede your judgment. You may think that you're alright to drive home when really you can't walk a straight line. Even a small amount of alcohol causes many people to act aggressively. The likelihood of the aggressor abusing his or her spouse or child is much higher. If you suspect that you have a problem with drinking there are a few things that you can do. First of all, you must admit that you have a problem. But it's not enough to say it. You must break you denial by doing something about it. You can go to twelve step meetings and request help from a sponsor. This person can serve as your accountability partner. He or she will check in on you from time to time to make sure that you are achieving your goal of being clean and sober. You'll want to keep this person informed as to how you are coping with your addiction and if you have a craving to drink, the sponsor is the one to call. You can also combat the effects of alcohol abuse and get relapse prevention techniques with a therapist. You will not simply explore the underlying issues causing you to drink, you’ll learn new thinking strategies to get you to move on. You can join recovery groups, where you get support and understanding from the members, but you must attend regularly. Other alcoholics will know how hard it is to kick the habit. You can identify with them because the effects of alcohol abuse makes you a member of their community. Last but not least, you'll want to confide in your family members and friends. Being able to trust others with your secret will help your recover more quickly, because you won’t feel you have to hide the secret. seek help immediately You can't do it by yourself and you shouldn't have to. Help is available you simply have to reach out and get it. From effects of alcohol abuse to stop being addicted.